Kadai gobi and beans recipe - Kadai gobi and beans is a quick and easy to prepare sabzi that can be made within ten minutes. 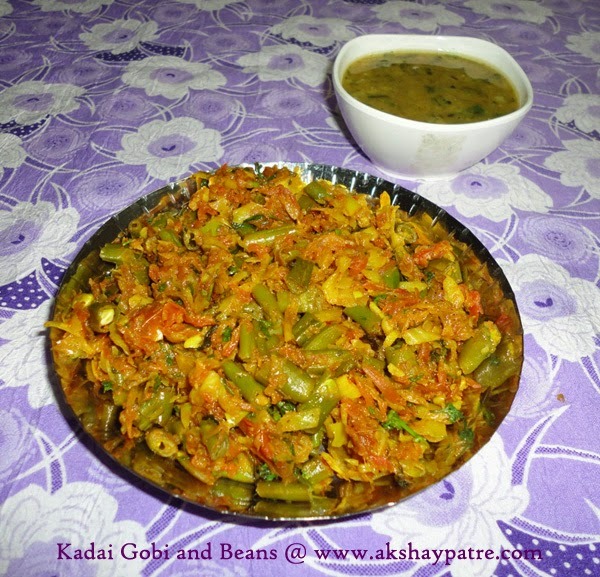 Kadai gobi and beans is nothing but a sabzi with spicy flavor and a fiery taste. I make kadai sabzis quite often with almost all vegetables. Chapati and rice is our staple food, so, I need side dishes for both everyday. On vegetarian days, sometimes, without thinking much, I go for kadai sabzis which goes well with both roti or chapati and rice with curry. We enjoyed it with rice and kasuri methi dal, and chapati along with papad and mango pickle. If I make stir fry it is going to be very simple and miss those flavor and taste. But this kadai variety of sabzis are quite interesting and delicious. Heat the oil in a pan and make a seasoning with mustard seeds, cumin seeds and curry leaves. Add the onion and stir until onions are translucent. Add the cabbage and beans. Stir to combine. Cook covered on low flame till the cabbage and beans become soft. 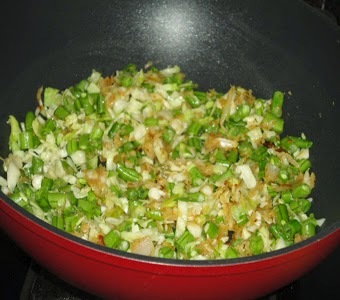 Once the cabbage and beans become soft, add the ginger-garlic-chilly paste and saute nicely until raw smell disappears. Add the tomatoes and saute a minute. Add the chilly powder and turmeric powder, stir to combine. Add the garam masala and salt. Mix well. Cover the pan with lid and cook for 3-4 minutes on low flame. If its too dry, sprinkle some water. Once done, add the chopped coriander leaves and serve the kadai gobi and beans hot as a side dish. 1. Heat the oil in a pan and make a seasoning with mustard seeds, cumin seeds and curry leaves. Add the onion and stir until onions are translucent. Add the cabbage and beans. Stir to combine. 2. Cook covered on low flame till the cabbage and beans become soft. 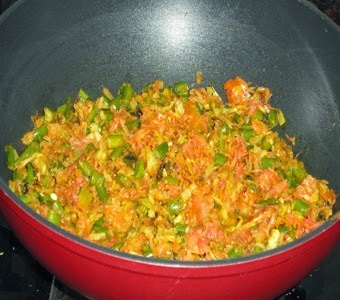 Once the cabbage and beans become soft, add the ginger-garlic-chilly paste and saute nicely until raw smell disappears. 3. Add the tomatoes and saute a minute. Add the chilly powder and turmeric powder, stir to combine. Add the garam masala and salt. Mix well. Cover the pan with lid and cook for 3-4 minutes on low flame. If its too dry, sprinkle some water. 4. Once done, add the chopped coriander leaves and serve the kadai gobi and beans hot as a side dish. 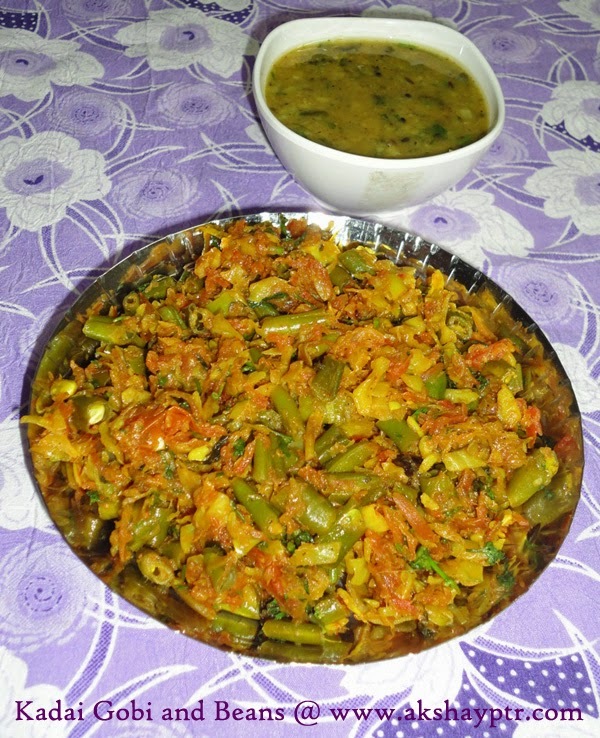 Delicious side dish, can have it happily with a bowl of rasam rice.